Due to technical issues we can’t do a full blog today but just to let you know that everyone has had another amazing day (in sunshine!) full of adventure and they’ll be able to tell you all about it tomorrow! Wales gave us some of its best wild weather today. 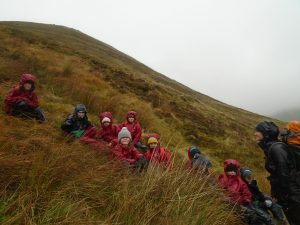 Heavy rain and high winds made all the activities even more challenging. Group 1 had their turn in the caves. Again all the children managed to find the courage to crawl through the narrow letterbox. 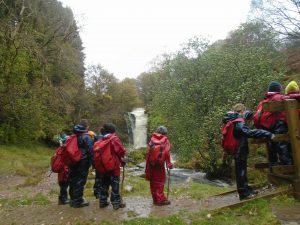 The waterfall walk was very dramatic – all the extra rain had turned the waterfall into a huge cascade, which they appreciated from a safe distance! 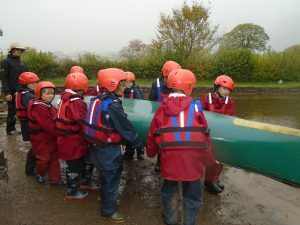 Group 2 battled against the wind and rain on the canal. Making a canoe go in a straight line is tricky at the best of times, but when the wind keeps blowing you backwards or into the bank it takes even more determination to keep going. But they did! Group 3 braved the mountains. Due to the high winds they stayed a bit lower and walked alongside rushing streams and waterfalls in the relative calm of the woods. But then they headed uphill, scrambling up the steep slope into increasingly strong winds and needle sharp rain. 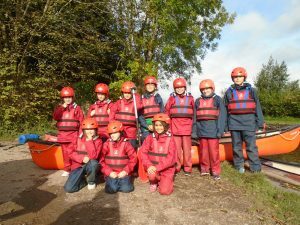 It was very wild and quite challenging to even stand upright but the children kept going. Every child today has shown real resilience in difficult conditions – and the staff have done pretty well too! Brecon Beacons – day two. It’s been a fun-packed day full of adventures and personal achievements. 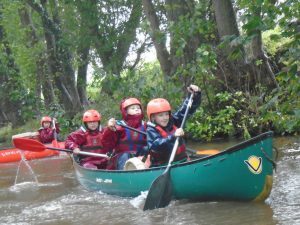 Group 1 headed to the canal for a day of canoeing with team work as the major focus of the day – from unloading and reloading the canoes to actually making them go in a straight line along the canal! A hard day of paddling ended with a huge water fight which really wasn’t started by Miss Baldwin! Group 2 headed for the hills. They followed a stream with multiple slippery crossings in low cloud and drizzle before summiting Fan Frynych into clear air with fantastic views. 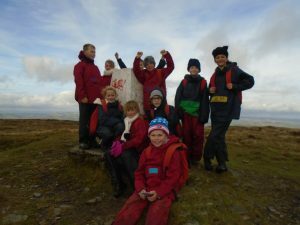 It was a long hike but the children were such great walkers they made it back to the Mountain Centre without the minibus. Group 3 headed into the mouth of the cave where it was very wet! Everybody made it through the letterbox, several of them conquering their fears to squeeze through. After lunch they headed to the waterfall, crossing a raging river with only a few dunkings! Tomorrow we’ll be canoeing and mountain walking after ANOTHER good night’s sleep. At the end of a very straight forward journey we arrived at the Hampshire Mountain Centre in beautiful sunshine. After a tour around the centre, the children found their rooms, heaved their bags up the stairs, unpacked and undertook the task of getting duvets into duvet covers – some more successfully than others! Then it was time to get kitted out with waterproofs and walking boots for the week ahead, housekeeping jobs were assigned and a much needed and delicious meal wolfed down. After dinner everyone got into their gear and we went for a nightwalk up onto the hills behind the mountain centre. Unfortunately there weren’t many breaks in the cloud cover to see the stars or the moon but stomping around the dark countryside by torchlight was great fun. Right now the children are getting into pyjamas ready for a hot chocolate and (hopefully!) a very good night’s sleep! We’re all looking forward to new adventures tomorrow! Please find the leaflets for your child’s class. There is one leaflet for parents and one for children for each class. To view the second page of the leaflet, hover on front page and use toolbar to move to second page. Please complete these surveys that the digital leaders have created in order to find out more about yours and your child’s computing knowledge and interests. This is a test post to demonstrate the school blog. Firstly a big thank you to everybody who contributed to our very successful toilet twinning charity events last week. If you have any sponsor money to return, please do so as soon as possible. Thank you. The final KS2 after school football club will run this Wednesday 3 April between 3:30 and 4:30pm. Please be aware there will be no brass tuition on Thursday 4 April, woodwind will go ahead as usual. We will be walking up to Durley Holy Cross Church for our annual Easter Service on Friday 5 April. We will be leaving school at 1:00pm, if parents would like to walk with us, please be at school by this time. Everybody is welcome to come back to school after the Service for refreshments and hot cross buns. Please remember there is no after school childcare club on Friday 5 April. The school will close for Easter break on Friday 5 April and will re-open on Tuesday 23 April 2019.